Sean and I got married in May of 2014. We crammed our wedding into probably one of the busiest summers of our lives. People were graduating college and grad school, I had the annual meeting at work, Sean was going for two long TDYs, and we thought we would be leaving for Dushanbe that summer. It was kind of then or never. When we found out Dushanbe would be delayed to 2015 it was too late to make any changes to the wedding plan, but it gave us freedom to also plan a honeymoon. We spent a lot of time trying to figure out what type of vacation we wanted. Did we want to hike around Iceland? Did we want to experience Japan? Did we want to explore Greece and likely witness Sean running around Thermopylae shirtless yelling “TONIGHT WE DINE IN HELL!” a la Gerard Butler in 300? Or, did we want to sit on a beach and do nothing for a week? We had always said we didn’t want a “clique honeymoon,” but after a year of planning a wedding on top of our already crazy-busy life, I could see why so many people opted for the island vacation. The timing also happened to coincide with Southwest Airlines opening up direct flights to Oranjestad, Aruba, so our decision was essentially made for us. Aruba is one of my favorite places. I had previously visited with my entire family when I was nine years old, so I was excited to return and experience this “One Happy Island” as an adult. This tiny little island is known for its dry, sunny weather, bright sandy beaches, and gentle surf. Constant trade winds bring beautiful breezes and cause the trademark divi-divi trees to slope southwesterly. Since Sean was busy with his TDYs, I took the lead in planning this trip, which is unusual for us. 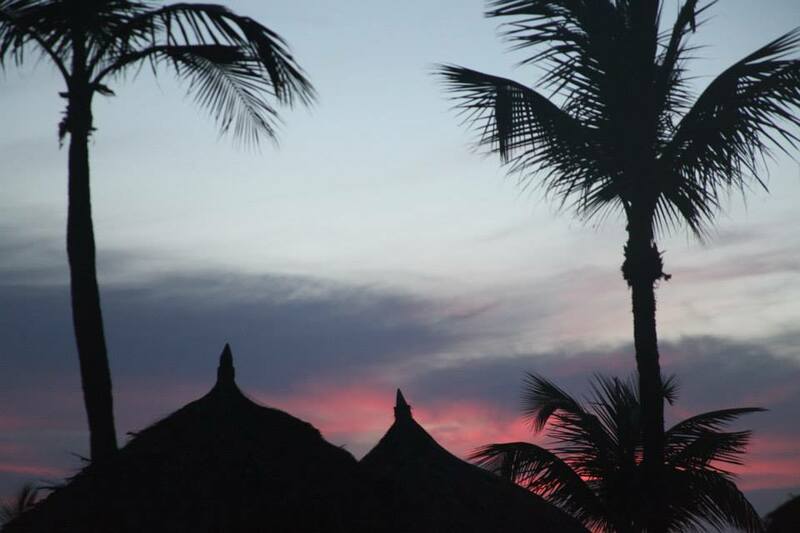 Aruba is a very small island, but where you stay can greatly impact your experience. We knew we didn’t want to say in the capitol city of Oranjestad, but didn’t necessarily want to be on Eagle Beach either since it’s crowded and noisy. That essentially left us with Manchebo Beach, which, if you ask me, is absolute perfection. When we arrived at Manchebo Beach Resort & Spa, we were greeted by Lincoln, and 19-year-old bartender. As we checked in he offered us complementary mojitos which were, as he said, “virgin, like me.” After we said that yes, we would like to add rum, he proceeded to turn over half the bottle into the two glasses. We were off to a good start. At the hotel, we opted for the non-all inclusive honeymoon package. Aruba only 19 miles long and we knew we’d want to explore, and, of course, eat at as many restaurants as possible. Over the course of our five-night stay, we ate grouper, conch, seabass, red snapper, paella, goat (yep…), and, oddly enough, brats. As two Wisconsin transplants living in Maryland, we were shocked and thrilled to discover Eagle Beach was home to a brat stand run by two Wisconsinites. We were repeat customers, obviously. Getting around the island is easy. There are taxis and a reliable public bus system that runs up and down the south side of the island. However, if you want to get to the Arikok National Park, which is home to an amazing natural pool, you’re going to need 4×4 transportation of some kind. We chose to rent a Jeep and spent an afternoon off roading on the north side of the island. This also gave us the freedom to drive out to Flying Fishbone restaurant for a beautiful evening watching the sun set over the water, and drag ourselves out of bed to catch the sunrise the next morning at Baby Beach. With our honeymoon package, we had the option to choose either a snorkeling excursion or an evening cruise. 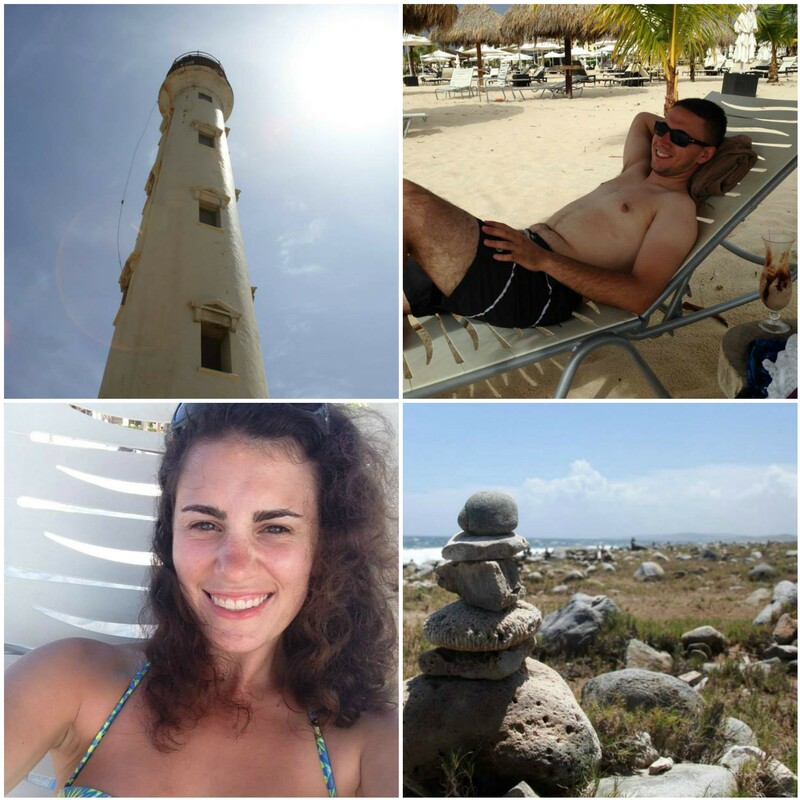 We chose snorkeling, and spent half a day exploring Aruba’s coral reefs and the Antilla Ship Wreck. The SS Antilla was a German cargo ship used during WWII which was scuttled (sank intentionally) in 1940. It’s one of the largest shipwrecks in the Caribbean and was a highlight of the trip. Another popular excursion in Aruba is horseback riding tours. 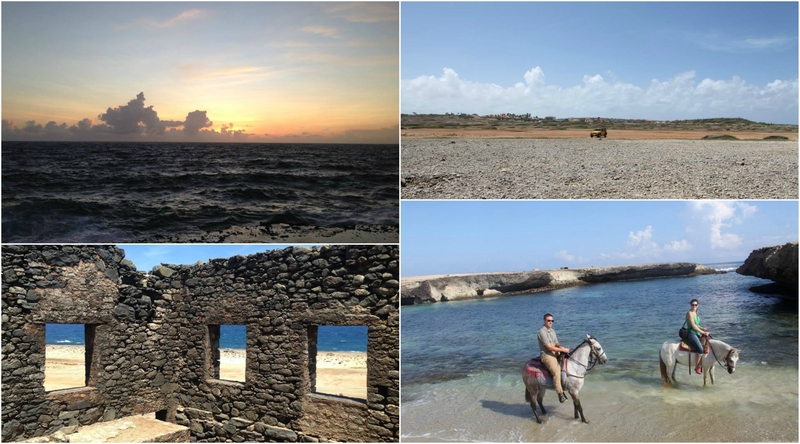 These tours are particularly excellent because you get to experience everything: trail riding, ocean views, gold mine ruins, all in a small group setting. I’m the product of three years of Girl Scout horse camp, so any excuse to ride again conjures up fond memories. However, this tour marked Sean’s second-ever time on horseback. Thankfully our guides were wonderful and the horses are exceptionally well-trained and he managed with no issues – despite the fact that his horse did not want to get in the water. Ever. 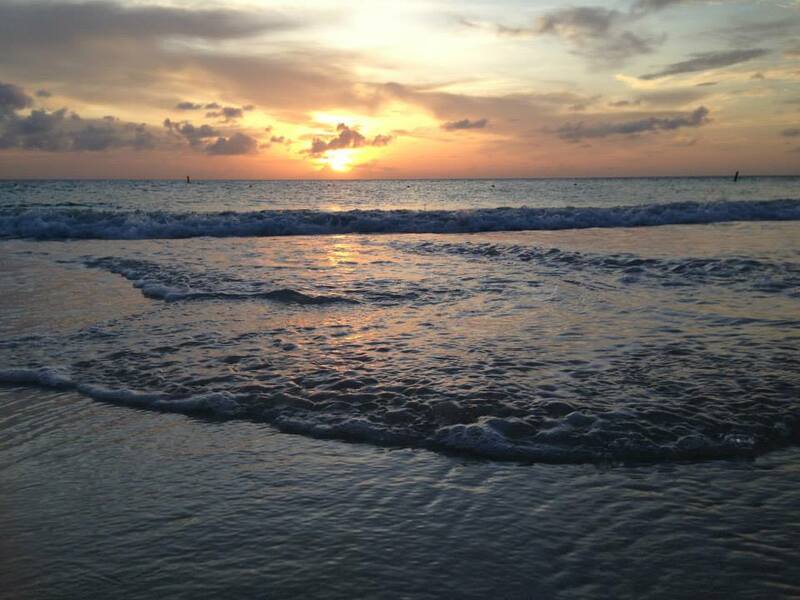 Aruba will always be a special place for us. It’s beautiful weather, unique landscape, friendly and welcoming locals, and abundance of activities make it the ideal spot for a beach vacation.